Ok, guys! I have a mouthful for you! 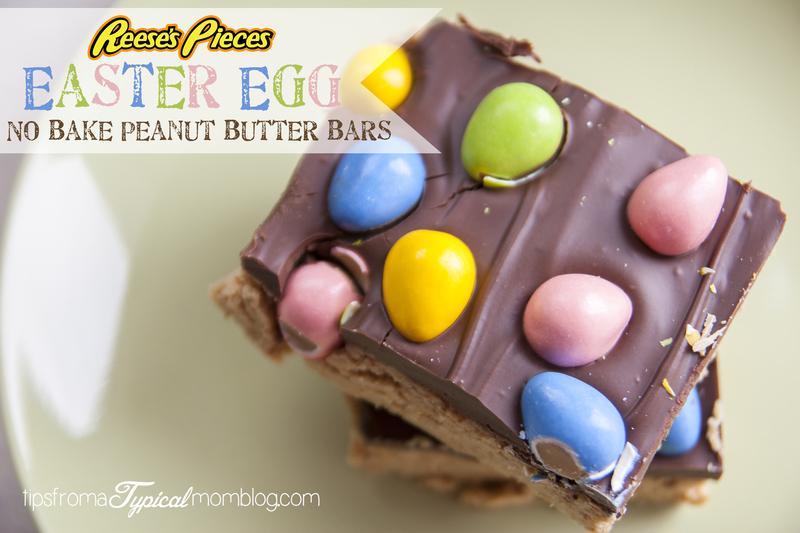 Reese’s Pieces Easter Egg No Bake Peanut Butter Bars. Every one of those words needs to be in there to understand how amazingly delicious and rich these are. Yes, I cut way too big of pieces. We had to cut those in half. These are SO easy and SO quick. Take off the Easter Eggs and you have a perfect recipe for Summer. No need to turn the oven on. I love the combination of peanut butter and chocolate. Who doesn’t? These bars are the perfect marriage of chocolate and peanut butter and the graham crackers add the perfect little crunch. These No Bake Peanut Butter Bars look impressive enough to take to a party, but so simple, it will be our little secret. 1. Combine powdered sugar and graham cracker crumbs. 2. Add the cup of peanut butter and melted butter. Mix well. 3. Foil line a 9×13″ pan. 4. Press the peanut butter mixture into the bottom of the pan. 5. Melt the chocolate chips with 2 tablespoons peanut butter at 30 second intervals until melted. 6. Pour melted chocolate over peanut butter mixture and spread in a decorative way. 7. Place Easter Egg Candies over the top of the chocolate and lightly press into the chocolate. 8. Refrigerate until chocolate is set. 9. Cut into bars with a sharp knife and serve. If there are leftovers, store them in the fridge. Now, like I said, you will want to cut the bars pretty small. A little goes a long way! Add the cup of peanut butter and melted butter. Mix well. Foil line a 9x13" pan. Press the peanut butter mixture into the bottom of the pan. Melt the chocolate chips with 2 tablespoons peanut butter at 30 second intervals until melted. Pour melted chocolate over peanut butter mixture and spread in a decorative way. Place Easter Egg Candies over the top of the chocolate and lightly press into the chocolate. Cut into bars and serve. If there are leftovers, store them in the fridge. These look so good! I’d love for you to link these (or any other recipes) onto my weekly link party! Thanks Jesseca, I’ll check it out! Mmm, Annette, these look delicious! I love chocolate and peanut butter and especially reeses! I can’t wait to give these a try!